A native of South Bend, Indiana, Michael Cole moved to Florence, Alabama at a young age. There, he painted and drew with an eye toward the architectural field. However, after attending Auburn University, Cole soon realized his dream of becoming an artist. Upon graduation, Cole moved to Orlando, Florida where he became a Disney artist. There, he worked on projects for the Disneyland and Hong Kong theme parks, including "A Bugs Life," Disney's Animal Kingdom, Pixar's "Toy Story" and "Hello, Mickey." While at Disney, Cole developed expressive fine art featuring the Looney Tunes characters. 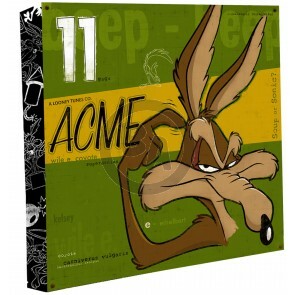 Having grown up watching Looney Tunes cartoons, Cole felt a particular affinity for Bugs, Daffy and the gang, and was inspired to develop unique imagery with these works. After his twelve-year stint at Disney and another two years with Universal Studios, Michael began Nolen-Cole, a gallery/eatery that featured live entertainment, located in his hometown of Florence. The gallery was an instant hit with the local Florence scene, as those who walked into Nolen-Cole were exposed to art free of presumption and inaccessibility. When not creating his own art, Cole works for the hit animation series "VeggieTales." His future plans include opening a second Nolen-Cole gallery in Franklin, TN. where he currently lives with his family and dog, Sadie. Owing to Cole's highly original and eclectic approach to the Looney Tunes characters, Clampett Studio Collections is proud to bring Michael Cole and his inventive style into our publishing family.